Jee Hwang’s works explore images of figure and objects from everyday life in painting. Observing individuals and people’s desire and relationships, Hwang produces realistic depictions of metaphorical scene in her paintings, which reflect her inner self and identity as an immigrant. 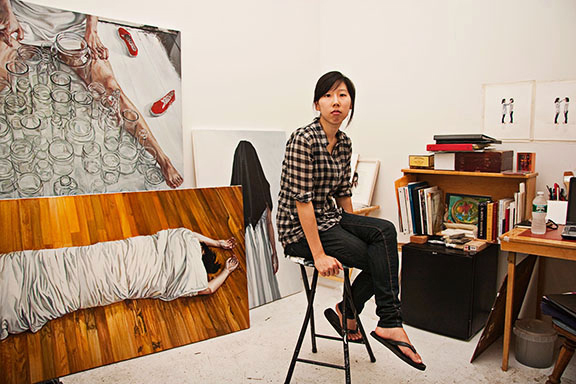 Hwang received her MFA in painting from Pratt Institute and her BFA from Salisbury University in Salisbury, Maryland. She has been awarded residencies from the Wassaic Project, Vermont Studio Center, and an Emma Bee Bernstein Fellowship from A.I.R. Gallery. Hwang has actively participated in solo and group exhibitions at a diverse range of venues in New York, New Jersey, Los Angeles and Seoul, Korea. Hwang is based in Kansas, teaching painting as an Assistant Professor in painting at Fort Hays State University.